We are always honoured to see our work featured in some of Australia's leading interior blogs and magazines. For any press enquiries or to access high res images from our photo shoots, please visit our Contact page to get in touch. Wall art adds depth and character to a room, and with so many styles to choose from – contemporary art, modern art, canvas art, wall art stickers, decorative art – it can be a little overwhelming. But it doesn’t have to be. In a world of flat-packed and mass-produced, how do you know if your new furniture is made from the real deal? Before navigating a market flooded with fake wood and faux fabrics, consider the following expert tips and buy with confidence. Always on the lookout for new artwork, we just adore these new limited edition photographic prints by Sarah Elshaug, Interior Stylist and Founder of Maitland Street Interiors. Trending : Animal Art - My Top 13 Picks! I am so excited to share with you an exclusive range of gorgeous prints capturing the essence of country life ... the Elsie & Hugo range ... EXCLUSIVE to The Interiors Assembly! ... We've gone a little bit country here at TIA ... and we are loving our new crew! Melbourne’s newest pasta bar, Lello, in Flinders Lane, offers a fresh and authentic take on traditional hand-made pasta offerings. Each dish tells a regional story, so when owners Chris McIntyre and Leo Gelsomino (who is also the head chef) wanted a beautiful new fit-out to reflect the elegance and comfort of Leo’s food, they turned to Sarah Elshaug of Maitland Street Interiors..
We're obsessed with the latest design by Maitland Street Interiors for Lello Pasta Bar in Melbourne. Green wall magic, love this colour, meet Sarah. There’s a well-worn Italian proverb that says, ‘Amici e vini sono meglio vecchie’, which basically translates as, ‘Friends, like wine, are best when aged’. Paired with perky service, this big-windowed corner spot makes for a fun and flavoursome night out with besties in a setting we’re sure Bellucci would approve of. How much do we love this space by Sarah Elshaug of Maitland Street Interiors? Let us count the ways. First, the contrast between bright white and jewel tones creates a stunning balance of airiness and weight, which is carried throughout the design with meticulous care. Embrace soft tones and luxe textures as you layer up in the cooler months. Forget kitchen sinks and bathroom tiles, the two most popular rooms to renovate might surprise you. According to a recent survey by Houzz, renovators’ average spend in 2016 on the laundry and master bedroom increased 24 per cent and 23 per cent respectively, making them the savvy renovator’s new top priorities. I first introduced you to Melbourne based furniture makers Felix Furniture last year. A small yet dynamic business, Felix Furniture was established in 2014 by Antonia Morrongiello and Ian Anderson; a couple who were inspired to follow their passion after years of making furniture for themselves. Melbourne’s Antonia Morrongiello and Ian Anderson of Felix Furniture have become unofficial ambassadors for that most underrated of materials – plywood! This afternoon we unveil adventurous new designs from the Sunbury-based duo. DDreaming of a chic and professional home office but low on dough? Don't despair. The key to pulling together the ideal workspace on a budget comes down to sourcing essentials that are both stylish and functional. Dreaming of a chic and professional home office but low on dough? Don’t despair. The key to pulling together the ideal workspace on a budget comes down to sourcing essentials that are both stylish and functional. The humble bovine isn’t often appreciated for its beauty. But Glen Iris artist Sarah Elshaug is determined to share their big brown eyes and simple charm with the world by photographing cows at her family’s farm in Balnarring. 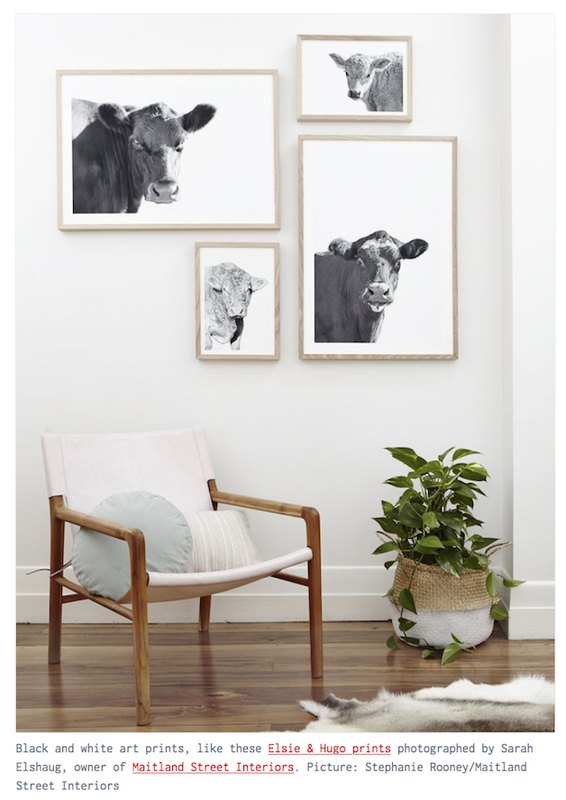 The new limited edition photographic print range by interior decorator and stylist Sarah Elshaug is a guest exhibit at The Big Shed, Balnarring. The plan was ambitious, but this couple’s smart design decisions delivered a sustainable, energy-efficient and cost-effective family home.